The Miniature Schnauzer is an active, happy, energetic, loyal and affectionate dog who will greet you with blissful "woo-woos" when you walk in the door. He wants to be at the center of your life and to spend as much time with you as he can. Quite often he will be devoted to his favorite person, but he will also bond happily with the rest of the family if there is one. He is playful and friendly, and loves to sit at your feet or in your lap, or play to romping games of fetch in the living room. He needs a daily walk, and also likes to play off leash in a safely enclosed area. He needs to find ways to expend his intense energy, or he will go a little wild and get into mischief and trouble around the house! He is very easy to train and obedient, and generally willing to please you, although he can be a bit stubborn and feisty at times. He needs clear guidance early in life to learn his manners, especially around other pets and people. He is an ideal watchdog. He is alert and will sound the alarm if he senses trouble. He has a deep, resonant bark that seems to come from a dog much larger than he is. He isn't yappy however, and will stop barking as soon as you give him the signal to go and make friends. Although aloof and suspicious with strangers at first, he will quickly be polite and get along. When around a strange animal he can be competitive at first, and may bluff or be falsely aggressive, which can get him into trouble. He should always be on leash when out walking. He may not be good with smaller animals and cats, because his instinct to chase and catch them is strong. He can get along with dogs and other pets if he is introduced properly, and socialized with them while young. He loves children and is generally very good with them, as long as they are well-behaved and not rough with him. He doesn't shed much at all - virtually nothing - and is a very clean dog, so he will be a good pet if you like your house neat and tidy. The Miniature Schnauzer is 11 to 14 inches tall (to shoulders) and weighs 10 to 18 pounds. He has a double coat consisting of a medium-length, wiry outer coat and a short, soft, dense undercoat. His coat color can be salt and pepper, black and silver, or solid black. His coat should only needs an occasional brushing. Pet coat: Clipped short every few months. Show coat: Stripped (dead hairs plucked out) every few months. The Miniature Schnauzer is a German dog who can be seen in paintings as far back as the 15th century. He is descended from Standard Schnauzers who were crossed with Affenpinschers and Poodles, as well as with smaller Schnauzers. 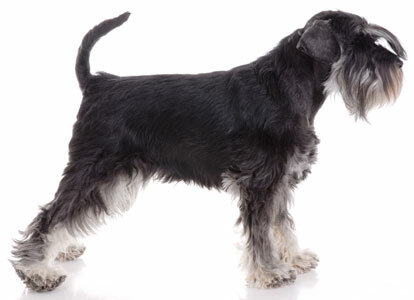 The Miniature Schnauzer was bred to be a small dog who could use his muzzle to go after rats and other vermin on the ground: "schnauze" means "muzzle" in German. He was first exhibited in 1899, and has been bred in America since 1925. He was admitted to the AKC in 1926. The American Miniature Schnauzer Club was formed in 1933, and he has become enormously popular in the decades since World War II. His AKC popularity was 11th out of 157 breeds in 2007.